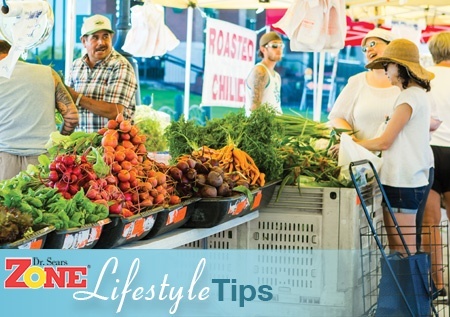 Take a stroll down your local produce aisle or farmer's market and you’d think summer was in full swing with the abundance of offerings from ruby-red berries and cherries, to tropical fruits and plentiful greens, not to mention all the fresh herbs and spices. Take a closer look on your next trip and you might notice some unusual finds. Maybe you’ve wanted to step out of your comfort zone to try one of these in the past but continue to walk past them unsure of how to prepare them. Don’t wait for the next episode of Chopped! Here’s a guide to 4 weird vegetables that are actually nutritious, tasty and easy to prepare. If you’ve never heard of these it’s because they’re in season for such a short period of time. 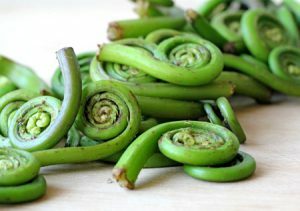 Typically harvested in the Northeast during early spring, fiddleheads are the furled fronds of young ferns (aka leaf or leaf-like part). Say that 10 times fast. They are rich in Vitamin A and Vitamin C, plus they contain B-vitamins and minerals like Iron and Potassium. What do they taste like? Fiddleheads have a grassy, spring-like flavor with a hint of nuttiness. They are a pleasant cross between asparagus and young spinach. Simply boil until tender, then drain. Lightly sauté in a little olive oil. Add salt and pepper for a delicious and nutritious addition to any meal. A member of the beet and spinach family and a popular leafy-green in the Mediterranean (not Switzerland), Rainbow Chard is the same as Swiss Chard but with brightly colored stalks of red, yellow, orange, purple and white. This vegetable is a nutritional powerhouse with 1 cup of raw chard clocking in at 374% of the Daily Value for Vitamin K while being rich in Vitamin A and Vitamin C, containing numerous minerals and 12 different polyphenols! What do they taste like? The leaves are slightly bitter, tender and are similar to beet greens and spinach. 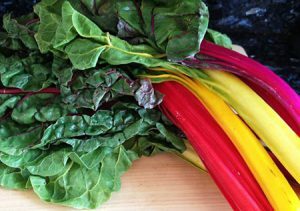 Rainbow chard is perfect in salads with a little olive oil and vinegar. They’re also good sautéed. The stems aren’t used often, but they too can be sautéed or even pickled. Jicama is a root vegetable. Yes, we know root vegetables aren’t the most favorable on the Zone diet, but this one is different. One cup of sliced jicama has 6 grams of fiber (24% of the daily value) and supplies about 40% of your daily requirement for Vitamin C, and also contains many other vitamins and minerals. Jicama is loaded with a type of fiber called oligofructose inulin. What makes inulin so unique is that it’s not completely digestible so it has a reduced caloric value, promotes good bacteria in your gut, and won’t raise blood glucose or insulin levels. 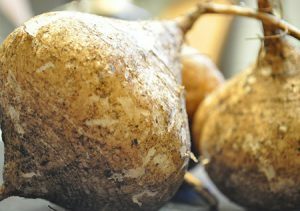 Oligofructose inulin gives jicama sweetness and a nice flavor. What do they taste like? Some have equated jicama to a savory apple. You can’t eat the skin of jicama, so scrub it well and peel it like you would a potato. Once peeled, you can slice it, chop it, cube it and eat it raw. It’s great in a slaw or mixed with other veggies, fruit salsas and great in stir-fries too. 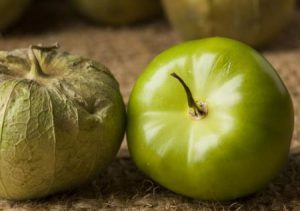 Tomatillos are native to Mexico and are actually a small green fruit surrounded by an inedible husk. They are most often associated with salsa verde, but they are a staple in both raw and cooked Mexican dishes offering a tart flavor. 1/2 cup of chopped tomatillo offers Vitamin C, Vitamin K and niacin, along with iron, magnesium, phosphorus, manganese and potassium. In addition, they’ve been recently shown to contain a phytochemical called withanolides which are known for their anti-cancer properties. What do they taste like? Tomatillos are often in Mexican sauces to add a fresh citrus-like flavor. The taste does vary, with some a little more sour, and others a little more mild and sweet. Simply peel away the husk and rinse in cold water. To roast, cut them in half and place them cut-side down on a sheet pan lined with aluminum foil. Eat them as is, or create a sauce of your choosing. Now that you’re a culinary expert on these veggies, you can put them into your shopping cart with confidence. What other unusual produce have you tried lately? Share in the comments below.